ABC Phonics - 26 Letters and Sounds! ABC Phonics – ABC Phonics: Sing, Sign, and Read! Powerful Strategies Build Writing Stamina – Learn how the Seminars work together. ABC Phonics – Sing, Sign, and Read! Overview – ABC Phonics: Sing, Sign, and Read! 20 Days to Mastery with 26 Letters and Sounds! with ABC Phonics: Sing, Sign, and Read! See video 20 Days to Mastery with 26 Letters and Sounds! Introduce the ABC Phonics: Sing, Sign, and Read! book with four new letters, key phonics symbols, and sounds every two or three days, dramatically reviewing previous letters. Spend no more than five minutes engaging the children in systematic instruction, then provide at least four short (20-30 second) reviews during the day: before morning recess, lining up for lunch, out on the playground, leaving for the day. Remind the children to show their parents how much they have learned and to keep practicing at home every night until they become ABC Phonics experts! Give each family a framed and laminated copy of the Free Family ABC Wall Chart. Attach magnets on the back for refrigerator art. Communicate the importance of learning these foundation skills early on, encouraging families to weave daily practice into their routines. Use the free ABC Phonics instructional videos in the classroom. These five quality videos are generously provided by our publisher, Sign2Me, and can also be accessed on our website and Sign2Me.com. Show one ABC Phonics video at your back-to-school night and encourage parents to use them! 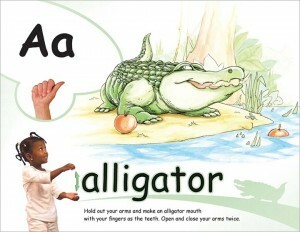 Immerse the children in consistent images from the ABC Phonics: Sing, Sign, and Read! program throughout the classroom: wall charts, miniature charts in literacy centers, posters in the hall, and copies of the book in your library. Fingerspell and refer to the key phonics images throughout the day, across the curriculum. Challenge children to demonstrate A to Z mastery as soon as the first child is ready. 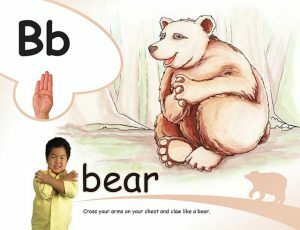 Let each child sing, sign, and perform the ABC Phonics signs using the instrumental version on the CD for accompaniment. These children will motivate others! Present each new expert with the ABC Phonics Certificate (free download) or a specially designed ABC Champ badge or crown. 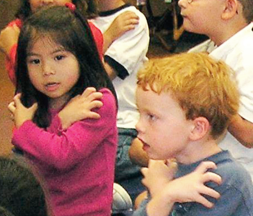 While a child is performing for the class, the other children can silently fingerspell along. Use volunteers or 4th grade buddies to help harder-to-accelerate students: Trace over the letters while saying the name and sound. Play games with large ABC cards or miniature flash cards. Practice. Practice. Practice. Practice makes permanent so practice accurately! 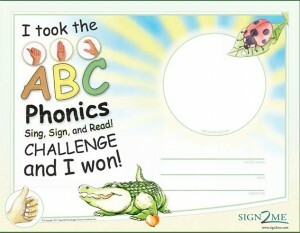 Send loaner copies of the ABC Phonics: Sing, Sign, and Read! book home for children to share. 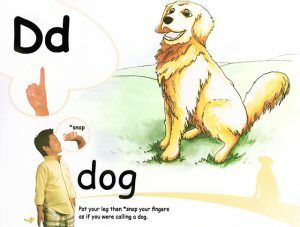 These books will later be used as guided reading materials: more experienced readers will enjoy reading the descriptions of each sign. See the ABC Phonics page for more instructional details, parent letters, informative articles and free ABC Phonics downloads. The ABC Phonics: Sing, Sign, and Read! book, charts and DVD, are available through Amazon and Sign2Me.com. 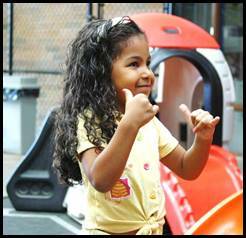 Children develop focus and self-regulation. When I asked some master kindergarten teachers if they would challenge their children to learn 26 letters and sounds in 20 school days, Winter Curry quickly responded, “We’ll do it! I will simply let the parents know how important it is to make this their September Family Learning Project.” She began brainstorming how she could fit more 20-30 second review sessions into the day. 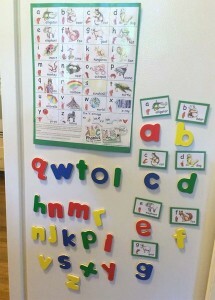 She already had a link to the instructional videos directly from her class website and planned to give each family a laminated ABC Phonics Chart (with magnetic tape attached) for refrigerator art! Becky Leber shared tips on her joyful accelerated approach to ABC and Phonics Immersion. At the fall Parent Orientation (before school starts) she introduced the parents to ABC Phonics: Sing, Sign and Read! by showing them one of the 5 free instructional videos. Then she actually took parents on a “computer walk” showing them exactly how to access the ABC Phonics page. She gave families the ABC chart and enlisted their commitment to daily practice at home. With children who do not easily learn every letter and sound, her Title I school provides RTI intervention. We applaud Head Start programs and Title I schools that include the Family Reference Chart and links to video clips of ABC Phonics: Sing, Sign, and Read! with spring registration. When families practice all summer we see amazing results come September in kindergarten. 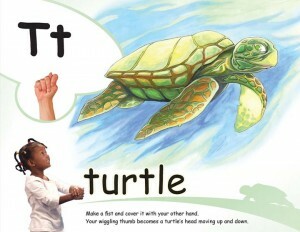 Turtle” is a favorite sign: Your children will delight in learning ABC Phonics skills with American Sign Language. We promise! –N.E. 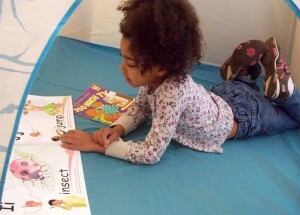 Photos from ABC Phonics: Sign, Sign, Read! by Nellie Edge and Sign2Me Early Learning© 2010. Why not take the challenge? 20 days to 26 letters and sounds! 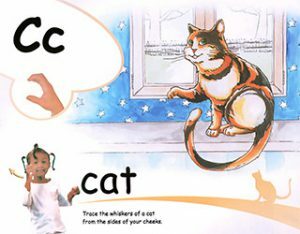 This approach to joyful accelerated literacy connects ABC Phonics: Sing, Sign, and Read! and the Common Core Standards. Common Core is, after all, a call for accelerating students’ literacy development. …learners achieve when they are working toward crystal clear and ambitious goals that they can envision, and when they receive feedback in the form of medals and mission… become a school where professionalism involves recognizing implementing and improving upon high-impact teaching practices. Excerpts from Pathways to the Common Core: Accelerating Learning by Lucy Calkins, Mary Ehrenworth, and Christopher Lehman. Heinemann, 2012. Share your ABC Phonics success stories with us. They may appear on our upcoming blog! Make these strategies routine in your classroom. High-Impact Strategies to Inspire Your Practice. Free Downloads! For FREE Nellie Edge resources visit our TpT store. © 2019 Nellie Edge Resources, Inc. All rights reserved. Reproduction without permission prohibited. Your e-book will arrive shortly.